Sometimes there is a need to delay or schedule sending email such as future company announcements and birthday greetings. Luckily for MS Office users, Microsoft Outlook makes this task easy and simple. It has a built-in option which you can enable if you wish to. 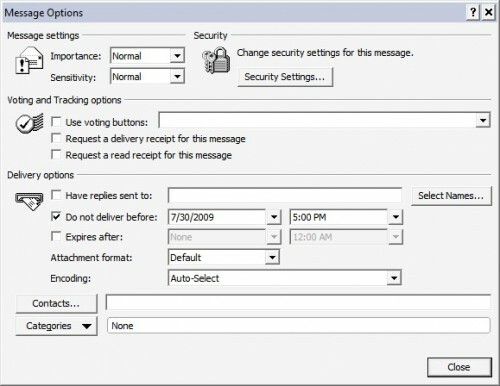 To schedule an email, just create a new mail message, click the Options menu then click on the "Delay Delivery" button under More Options section as shown below. 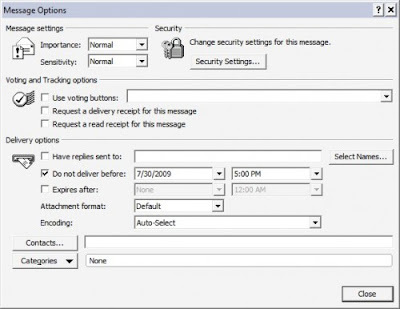 Then on the Message Options dialog box, check the "Do not deliver before" and specify the date and time when you want the email to be send out. After you close the dialog box, finish your email then fire the send button. MS Outlook will automatically treat it as scheduled email and will automatically send it on the date/time specified.